to see the trap in which we are ensnared. who are the rulers in every country? a banking class of a certain caste. to fix the slums but really creates more. governments with guns make us weaker. on orders from their G-d, which is themselves. do not a warm hearth make. and realize who is about to kill you both. I was talking the other day to the only American militia man who I don’t suspect of being a government plant, the screenwriter and former mercenary J. B. Campbell, about what could possibly be done with this troublesome element that has sabotaged societies for at least the past 400 years, and he simply said they need to be rounded up and put in one place so they could feed on themselves for a change instead of everybody else like they do now. He began to speculate on possible locations within the continental U.S., and I stopped him. This isn’t a problem in just one country. This is a worldwide network of greed and criminality we’re talking about, that has sunk its fangs into every nation on this earth. Hell, even right now we’re looking at the militarization of Patagonia, with rich Jews owning land that completely spans the whole South American peninsula down where it starts to get cold. I wonder what kind of fortress the Israelis are building there, for use once they blow up the entire Northern Hemisphere? Whatever move can be made against this evil financial octopus that has the whole world locked in its compound interest tentacles has to happen in every country all at once, or else the Jews will just do their Marrano thing, and fasten onto to some other country. I wish I knew more about China, but the scuttlebutt is that the richest people in China are all Jews. I was talking the other day to someone else and she and I were discussing that the game — the fight to retain some shard of individual liberty and independent happiness that didn’t have to be regulated and approved by the government — is already long over. All we’re doing exploring all these issues is really kind of a post-mortem, because the die is cast. America is fractured beyond repair and about to be divided into some kind of regional districting, all depending on the disaster they choose to hasten and initiate this affair. They used to say what happens in the U.S. eventually happens to the rest of the word. I think they must have been talking about movies, crack cocaine or camouflage jackets, because I’ve discovered the opposite is quite true. America is, with each passing day, more and more resembling Palestine, as I have frequently predicted during the past decade. Walls are going up to protect fashionable suburbs from the neglected masses. More and more resembling Iraq, a prosperous country that was obliterated for reasons that were lies, that we knew were lies, and yet we, still telling ourselves that we are free Americans in control of our country, allowed it to happen. And even waved the flag when we did. More resembling Afghanistan, with heroin already in Philadelphia elementary schools, according to neighborhood gossip. This state of stupefaction that allows supposedly civilized people to acquiesce to a rampant policy of mass murder and torture of innocents on the basis of stories so flimsy they wouldn’t get past a middle school debating team — what has the American population become? Robotized, is what. Courage, honor and loyalty have gone out of fashion, and consumption, consciencelessness and coma have replaced them. Stupefaction. Sheeple ready for slaughter. You’re part of this target population, pal. What’s your strategy? Mine is to try to kindle a worldwide effort to understand that crime runs the world, and that our most venerated leaders are right in the middle of all it. The secret element to world politics is the crime — the drugs, the slavery and all the other vices — and we can’t even get the real picture of what’s happening because of the dark influence of all these illegal but invisible industries whose tentacles twist around the throats of every elected politician in the world. To me the simplest dividing line — and ultimately, the most necessary — is the money. Money is the power to buy guns, essentially. It’s what everybody wants, and the few that have it — possessed of every advantage — work real hard to keep it. Think preemptive war being waged on you, getting worse every day. This all has to be derailed if we are to keep our sanity and our planet. I’m betting — and I think it’s a pretty safe bet — that the majority of people on this planet are pretty decent folks, with sons and daughters they want to keep safe in cultures they’ve grown to love. They are all being squeezed by this same financial octopus, too, this same inequality between politicians and the people. I think that if all the people in the world who genuinely believe in a higher power were suddenly to focus their attention on that one special group that has commandeered so much of the world’s resources simply by being clever bookkeepers and ruthless exploiters of people’s weaknesses, that several positive things might happen. First, the vibrations alone are likely to significantly interfere with their otherwise spiritually oblivious thought processes. This might impede their daily cheating in the financial markets of the world, but probably wouldn’t slow the murder rate of Jewish doctors whose Talmud tells them to kill rather than cure. But slowly, to maximize the cash. A worldwide celebration that liberation is at hand, financial freedom is possible for everyone instantly. And also a perhaps angry response toward all those people who have deliberately fooled us over all these many centuries with a cornucopia of scams that we were just too naive to comprehend. That’s how they always took our money, and still do. I respectfully submit this to everyone’s attention for the reason that I can think of no more worthwhile project on the entire planet. John Kaminski is a writer who lives on the Gulf Coast of Florida, currently on financial life support provided by some of his readers. 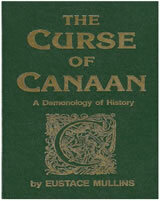 As a gift for reading this far, I attach a PDF file of what is probably the single most important political book existing in the world today, Eustace Mullins’ “The Curse of Canaan,” which details down through history the ascendance of this one group of financial criminals through the ruin of country after country. No book I know of is more relevant to the political situation in the world today.